Samsung will finally upgrade to Android Gingerbread 2.3 on the Galaxy S smartphone and Galaxy Tab tablet, the company announced Monday. Samsung did not say when exactly it will push out the update, except that the rollout begins in mid-May in the U.K., then goes through to Europe, North America, and the rest of the world. The handful of Samsung devices to get Android 2.3 includes the Galaxy S smartphone, Galaxy Tab (7-inch) tablet, and the lower-end Ace/Gio/Fit/mini phones. The upgrade will be available via Kies, Samsung's device management software, which can be downloaded from Samsung's website. The Galaxy Tab, the 7-inch model will be upgraded only to Android 2.3 this time around, unlike its bigger siblings, the 8.9 and 10.1, which will arrive with the tablet-optimized Android 3.0 on board later in June. Google Android 2.3 was first released in late 2010, and five months later it can only be found on percent of the 100 million Android devices out there. Samsung says the upgrade from Froyo 2.2 to Gingerbread 2.3 will improve the performance of your smartphone or tablet, as multimedia content consumes less CPU power, and boost 3D graphics and NFC support. 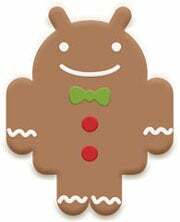 It's unclear which Gingerbread point release Samsung will use to update its devices. The latest one is Android 2.3.4, which adds video chat in Google Talk. The next version of Android for smartphones is called Ice Cream Sandwich and is set to arrive toward the end of this year. While it may take while to reach most Android smartphones, you can look forward to implementation of the holographic UI found on Honeycomb tablets, among other features.